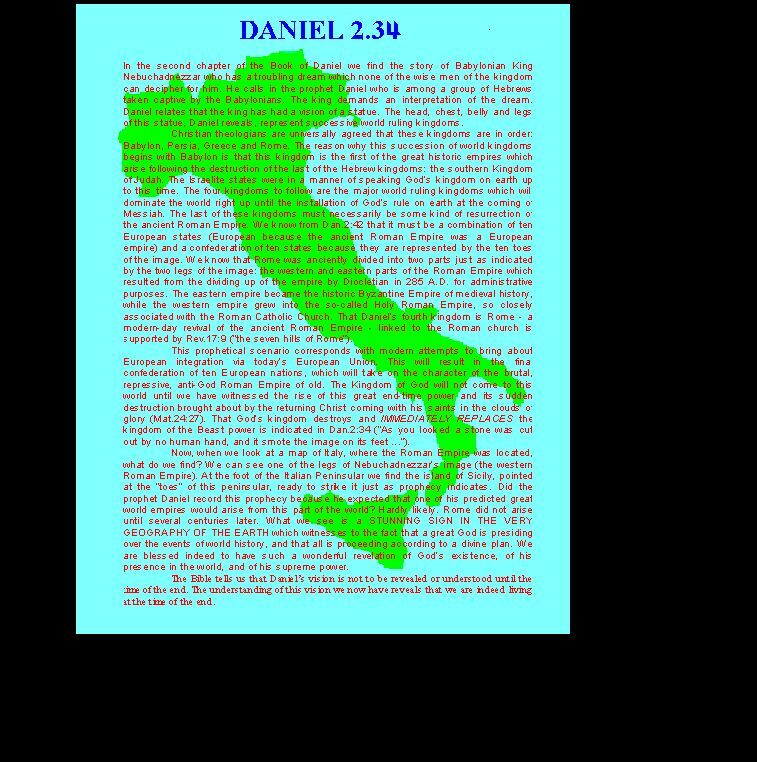 The prophecies of Daniel are revealed in the very geography of the Earth! It has always been said that the Italian boot kicks Sicily into the sea, but in truth it is the other way around! In the second chapter of the Book of Daniel we find the story of Babylonian King Nebuchadnezzar who has a troubling dream which none of the wise men of the kingdom can decipher for him. The prophet Daniel who is among a group of Hebrews taken captive by the Babylonians, offers to interpret the dream. Daniel relates that the king has had a vision of a statue. The head, chest, belly and legs of this statue, Daniel reveals, represent successive world ruling kingdoms. Christian theologians are universally agreed that these kingdoms are in order: Babylon, Persia, Greece and Rome. The reason why this succession of world kingdoms begins with Babylon is that this kingdom is the first of the great historic empires which arise following the destruction of the last of the Hebrew kingdoms: the southern Kingdom of Judah. The Israelite states were in a manner of speaking God’s kingdom on earth up to this time. The four kingdoms to follow are the major world ruling kingdoms which will dominate the world right up until the installation of God’s rule on earth at the coming of Messiah. The last of these kingdoms must necessarily be some kind of resurrection of the ancient Roman Empire. We know from Dan.2:42 that it must be a combination of ten European states (European because the ancient Roman Empire was a European empire) and a confederation of ten states because they are represented by the ten toes of the image. We know that Rome was anciently divided into two parts just as indicated by the two legs of the image: the western and eastern parts of the Roman Empire which resulted from the dividing up of the empire by Diocletian in 285 A.D. for administrative purposes. The eastern empire became the historic Byzantine Empire of medieval history, while the western empire grew into the so-called Holy Roman Empire, so closely associated with the Roman Catholic Church. That Daniel’s fourth kingdom is Rome - a modern-day revival of the ancient Roman Empire - linked to the Roman church is supported by Rev.17:9 ("the seven hills of Rome"). This prophetical scenario corresponds with modern attempts to bring about European integration via today’s European Union. This will result in the final confederation of ten European nations, which will take on the character of the brutal, repressive, anti-God Roman Empire of old. The Kingdom of God will not come to this world until we have witnessed the rise of this great end-time power and its sudden destruction brought about by the returning Christ coming with his saints in the clouds of glory (Mat.24:27). That God’s kingdom destroys and IMMEDIATELY REPLACES the kingdom of the Beast power is indicated in Dan.2:34 ("As you looked a stone was cut out by no human hand, and it smote the image on its feet ..."). Now, when we look at a map of Italy - the famous Italian boot - where the Roman Empire was located, what do we find? We can see one of the legs of Nebuchadnezzar’s image (the western Roman Empire). At the foot of the Italian Peninsular we find the island of Sicily, pointed at the "toes" of this peninsular, ready to strike it just as prophecy indicates. Did the prophet Daniel record this prophecy because he expected that one of his predicted great world empires would arise from this part of the world? Hardly likely. Rome did not arise until several centuries later. What we see is a STUNNING SIGN IN THE VERY GEOGRAPHY OF THE EARTH which witnesses to the fact that a great God is presiding over the events of world history, and that all is proceeding according to a divine plan. We are blessed indeed to have such a wonderful revelation of God’s existence, of his presence in the world, and of his supreme power. The Bible tells us that Daniel’s vision is not to be revealed or understood until the time of the end. The understanding of this vision we now have reveals that we are indeed living at the time of the end. NOTE TO READERS: A VERSION OF THE ABOVE ARTICLE APPEARED IN A SABBATARIAN PUBLICATION CALLED 'SERVANTS NEWS' IN MARCH 1997 UNDER THE TITLE 'A STONE CUT WITHOUT HANDS'. THIS ARTICLE LARGELY REPRESENTED THE VIEWS OF THE EDITOR AND SIGNIFICANTLY MISREPRESENTED THE VIEWS I HAD INTENDED TO PUT FORWARD.